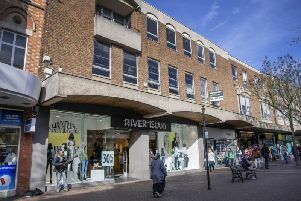 Emergency services were called to a road in Northampton town centre after fears of a collapsing wall. A member of the public reported the danger in St Michael’s Road, Upper Mounts, earlier today. Parts of a newly-repaired wall appeared to be bulging precariously over the pavement. Firefighters from The Mounts station attended and police cordoned of the one-way road over fears for the safety of pedestrians and motorists. Building control officers from Northamptonshire Borough Council have since served a notice on the owner of the wall and fenced off the area. They have carried out emergency repairs and will bill the owner for the cost.